New mural painting workshop at Cristi Fer Art Studio in San Miguel de Allende. 8 days of mural painting experimenting and 12 days vacation in San Miguel de Allende. No experience? No problem! You can do it! Either you want to experience the magic of mural or large scale painting, this workshop is for you! BIG surface, large images, bright color, big strokes of paint, expansive horizons! Learn the basics from planning to execution, use of color and composition! Be experimental and gain confidence! Topics and execution from traditional to contemporary. Take home a 4 Ft. x 8 ft. mural on canvas. 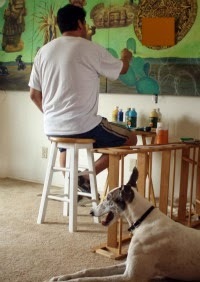 Work with Mexican Muralist Fernando Gonzalez on your own mural on canvas. Cost includes theory, hands on and materials. Maximum 6. You'll have time to enjoy and explore San Miguel!